Thai Square Redfern uses their own specialised couriers to deliver their food. Deep fried spring roll filled with carrot, cabbage, black fungus and glass noodle served with sweet chilli sauce. Deep fried bean curd served with sweet chilli sauce. Deep fried fish cake made of minced fish, red curry paste and kaffir lime leaves served with sweet chilli sauce. Crispy money bag stuffed with crab meat, minced chicken, diced onion, carrot served with sweet chilli sauce. Steamed minced chicken and diced onion wrapped in wonton sheet served with special homemade soy sauce. Deep fried homemade pastry stuffed with curry minced chicken, potatoes, carrot, peas served with plum sauce. Deep fried marinated chicken middle wings served with sweet chilli sauce. Skewers of marinated char grilled chicken tenderloin served with peanut sauce. Deep fried spring roll filled with chopped roasted duck, carrot, cabbage, black fungus and glass noodle served with sweet chilli sauce. The most popular hot and sour soup flavoured with lemongrass, kaffir lime leaves, galangal, lemon juice and chillies with your choice of vegetables, chicken, seafood garnished with spring onion and coriander. Thai style light coconut soup with galangal, Thai herbs, garnished with your choice of chicken, prawn, vegetables or tofu, granished with spring onion and coriander. Clear chicken stock soup filled with mix vegetables, preserved raddish your choice of chicken, prawn, vegetables or tofu garnished with spring onion and coriander. A warm salad of steamed minced chicken mixed well with red onion, green onion, mint leaves, coriander dressed with lime juice, fish sauce, chillies and the essential toasted rice crunch. Thailand's most famous salad with green papaya, carrot, cherry tomatoes, green beans, peanuts, tossed through garlic, chillies and special tamarind dressing topped with cashew nuts. Grilled sliced beef mixed with red onion, cucumber, tomatoes, Thai herbs, flavoured with Thai style hot and sour dressing. Sliced roasted duck seasoned with red onion, cucumber, tomatoes, Thai herbs, chili jam and lemon juice. A salad of glass noodle mixed with king prawn, minced chicken, red onion, tomatoes, Thai herbs, chillies and lemon juice. A salad of king prawn, calamari, mussel mixed with red onion, cucumber, tomatoes, Thai herbs, flavoured with spicy lemon dressing. Stir fried minced chicken, green beans, bamboo, onion with garlic, chillies and hot basil leaves. Thin rice noodle with pork balls, slice lean pork, bean sprouts, Chinese broccoli in special homemade herbal pork blood broth, topped with spring onion, coriander and pork crackling. Thin rice noodle, bean sprouts, crusted peanut in spicy and sour soup, topped with spring onion, coriander and crispy wonton. Thin rice noodle with pork balls, minced chicken, bean sprouts tossed with homemade special sweet soy sauce, topped with spring onion, coriander, crushed peanuts, chilli flake, lemon and crispy wonton. Egg noodle, bean sprouts tossed with homemade special sweet soy sauce, topped with char grilled marinade chicken thigh fillet, garnished with spring onion and coriander. Steamed jasmine rice, mixed salads topped with char grilled marinade chicken thigh fillet sprinkled with spring onion and coriander. Stir fried crispy pork belly, green bean, onion with garlic, chilies and hot basil leaves. Stir fried crispy pork belly. Chinese kale, carrot, broccoli, capsicum with garlic and oyster sauce. Thin rice noodle with sliced roasted duck, bean sprouts, Chinese celery in chicken stock soup, sprinkle with spring onion and coriander. Stir fried crispy pork belly with chilli paste, green beans, capsicum and vegetables. Roasted duck cooked through medium flavoured red curry and coconut milk, lychees, pineapple, cherry tomatoes and vegetables. Thai style fried egg mixed with chopped prawn, onion, tomatoes and green onion served with sweet chilli sauce. Stir fried king prawn with mix vegetables dressing with delicious homemade tamarind sauce. King prawn cooked through tasty mild flavoured panang curry, Thai herbs and coconut milk, served with steamed vegetables on a side. Grilled salmon fillet over mixed salads served with Thai style spicy and sour dressing. Mix seafood teeming with king prawn, calamari and mussel cooked through curry paste with coconut milk and Thai herbs sprinkle with kaffir lime leaves. Spicy stir fried scallop with Thai herbs, green peppercorn, chilli paste, kachai, kaffir lime leaves, chillies and basil leaves. Grilled Thai style marinated beef served with spicy lime sauce. The most popular Thai style grilled marinated chicken thigh fillet served with spicy lime sauce. Grilled Thai style marinated pork with lemongrass, garlic and pepper. 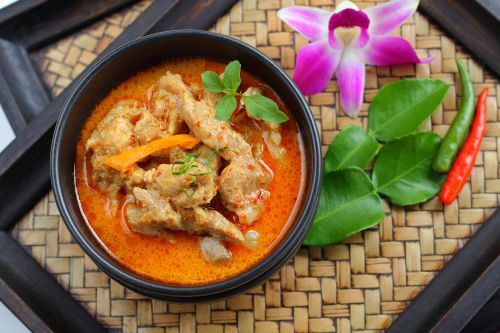 Hot flavoured green curry cooked through coconut milk and your choice of vegetables, tofu, meat or seafood. Medium flavoured green curry cooked through coconut milk and your choice of vegetables, tofu, meat or seafood. Spicy jungle curry uniquely cooked without coconut milk with pepper corn, seasonal vegetables, Thai herbs and your choice of vegetables, tofu, meat or seafood. Braised beef stewed in mild massaman curry with coconut milk, potato, onion, Thai herbs and spices. Stir fried mixed vegetables with chilli jam sauce and your choice of meat, seafood, tofu topped with cashew nuts. Stir fried mixed vegetables with fresh chillies, basil leaves and your choice of meat, seafood or tofu. Stir fried mixed vegetables with homemade garlic and pepper paste and your choice of meat, seafood or tofu. Stir fried mixed vegetables with oyster sauce and your choice of meat, seafood or tofu. Stir fried mixed vegetables with peanut sauce and your choice of meat, seafood or tofu. Stir fried pumpkin, broccoli, green onion, capsicum, egg and your choice of meat, seafood or tofu. Stir fried mixed vegetables with black bean sauce and your choice of meat, seafood or tofu. Thai style stir fried thin rice noodle with egg, bean sprouts, green onion through special homemade tamarind sauce, topped with crushed peanut and lemon wedge. Stir fried wide rice noodle with egg, vegetables, sweet soy sauce, with your choice of meat, seafood or tofu. Stir fried wide rice noodle with egg, fresh chillies, chilli jam, basil leaves, vegetables, with your choice of meat, seafood or tofu. Stir fried glass noodle (bean vermicelli) with egg, vegetables and your choice of meat, seafood or tofu. Stir fried hokkien noodle with egg, vegetables and your choice of meat, seafood or tofu. Stir fried wide rice noodle with vegetables, chilli jam, oyster sauce with your choice of meat, seafood or tofu. Stir fried wide rice noodle with vegetables, peanut sauce and your choice of meat, seafood or tofu. Thin rice noodle, vegetables, bean sprout, with your choice of meat, seafood or tofu in chicken stock soup. Thin rice noodle, mushroom, bean sprout, chillies with your choice of meat, seafood or tofu in Thai herbs Tom Yum soup. Thin rice noodle, vegetables, bean sprout, with your choice of meat, seafood or tofu in light curry and coconut milk soup. Stir fried wide rice noodle, vegetables with your choice of meat, seafood or tofu topped with potato starch gravy sauce. Stir fried jasmine rice and egg with soy sauce. Stir fried jasmine rice, egg, peas, corn, carrot with soy sauce. Stir fried jasmine rice with egg, crab meat, onion, green onion, Thai celery and shrimp paste (in soy bean oil). Thai style stir fried jasmine rice with egg, tom yum paste, kaffir lime leaves, onion, mushroom with your choice of vegetables, tofu, meat or seafood. Jasmine rice with egg, vegetables and your choice of vegetables, tofu, meat or seafood. Thai style fried jasmine rice with egg, fresh chillies, chilli jam, basil leaves and your choice of vegetables, tofu, meat or seafood. Thai style fried jasmine rice with egg, pineapple, mix peas, carrot, corn and your choice vegetables, tofu, meat or seafood in tomato sauce, topped with cashew nuts. Pearl tapioca gently simmered stirling through milk, pure cream, star ansie and orange zest, sprinkle with ground cinnamon. Steamed black sticky rice mixed well with coconut milk and palm sugar topped with Thai custard. Ducasse banana cooked in coconut milk and palm sugar.